We advise that you backwash your pool a little longer each week, to lower the water in the pool by an inch or two, and then topping up. This keeps the efficiency of the minerals and chemicals to a max. 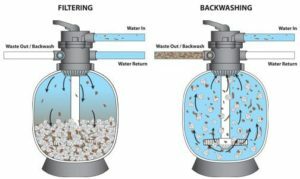 In an ideal world a pool would be emptied every couple of years, but this isn’t always practical or economical, so keeping the water refreshed using the backwash for longer method is a realistic solution. If you would like more information why your pool water needs refreshing see http://floatron.co.uk/faq then scroll down to TDS.